Lattes and pies aren't the only way to enjoy pumpkin this fall. 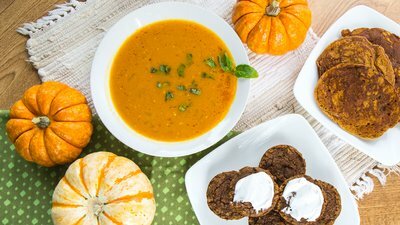 Make your taste buds (and your diet) happy with these pumpkin-themed paleo recipes. It's that time of year again. The leaves fall, the air gets colder, and there is an abundance of pumpkin-based everything wherever you go. If you're a fan of pumpkin, this time of year can be challenging when you have a restricted diet. Luckily, there are still healthy ways to get your pumpkin fix! Adding pumpkin to your pancakes is a great way to spice up your breakfast. Since they already have maple syrup in them, they taste delicious even without additional toppings. Prep them ahead of time for an easy breakfast you can grab on your way out the door. Take a break from all the pumpkin spice with this surprisingly rich and savory soup. Use spicy curry powder instead of sweet to kick it up a notch! These muffins have all the convenience of individually-sized treats yet still capture the flavor and texture of pumpkin pie. Although they are wonderful plain, add coconut whipped cream for the full pumpkin-pie experience. As a copy editor, Frieda has dedicated her professional pursuits to helping writers clearly communicate what they intend to say.